Looks: Some nugs were quite dense and tight while others were tight but, with a "fluffy" look to them. All were medium to small sized, heavily triched with a deep green color palate with ample and noticeable orange/rust color "hair." Smell: Minty lemon tea so pungent strong sniffs cleared up my nostrils as if I used a Vicks "nose stick" vapor inhaler. Taste: Smooth and earthy/piney with a bit of lemony "highlights." Buzz Type: A smooth, heavy, progressive full body high. Excellent pain relief with moments of cerebral pressure intensity causing a sense of "melting" and relaxation. * The very, very first strain I medicate the night I return with my first batch of meds from a newly joined collective and no joke... call 911 because this is FIRE! Still in slight therapy for my injury, I was nagged with a sharp, stabbing like internal shoulder pain and this batch Presidential OG got right at my intense deep shoulder pain with 10 minutes of putting the bong down! This strain has some serious pharmaceutical pain relieving qualities. This was like taking Vicodin or taking acetaminophen (which now may be linked to cancer if using high amounts). After a few sessions, I was actually able to control the "intensity" with this strain. One bowl would nicely bring me down just past the two hour mark in a relaxing and easing manner without much of a couch lock effect. This was great for winding down the evening and catching some television while actually being engaged vs. dosing off and waking up hours later. But, if I just need that straight knock out power, increase by a bowl more I was taken there with longer legs on a more euphoric run ending in a "soft couch" lock which transforms into some serious undisturbed sleep. In other words, I'd catch myself dosing off and I am left with just enough energy to prepare myself for sleep. But, if I missed that window, the end result was always some kind of embarrassment. On one occasion, I literally went couch lock for 2.5 hours with floss still in my teeth. If I started 5-10 minutes earlier I would have made it to bed. Overall, this was a very "smooth" high and enjoyable ride hitting on all my ailments! Just straight up FIRE! 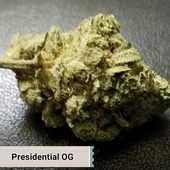 Presidential OG hits on all cylinders. I found it perfect for extreme pain relief and obviously; insomnia. If you are more on they hyperactive side, this WILL shut you down. Smoking this bud makes you feel so lifted maybe you will think you're president. The effects are strong after the first hit, smashes you in the face then flows around your body. Intense waves crash into for the next couple of hours then relaxation hits. Great nugs.